Over 1000 ACG courses are available to AIFS students on the Full Curriculum program. The courses listed below are only a sample of those offered in each area. If you do not see a course that you require, please contact the AIFS Admissions Officer. Semester students may choose up to 5 courses and Intensive (Fall Quarter students) up to 3 courses. Some courses listed are not available on the Intensive Fall Quarter program. Recommended credits are shown in parentheses. Courses are subject to change at the discretion of The American College of Greece. Basic principles, methods and techniques of financial management and their application within a business. Folkloric studies in twentieth-century Greece including a survey and critical appreciation of collections of oral literature. A brief survey of archaeology in the ancient Near East, Egypt and Greece in light of recent excavations. Students will study the aims, history, theory and methods of archaeology with emphasis on the Stone Age and Bronze Age. 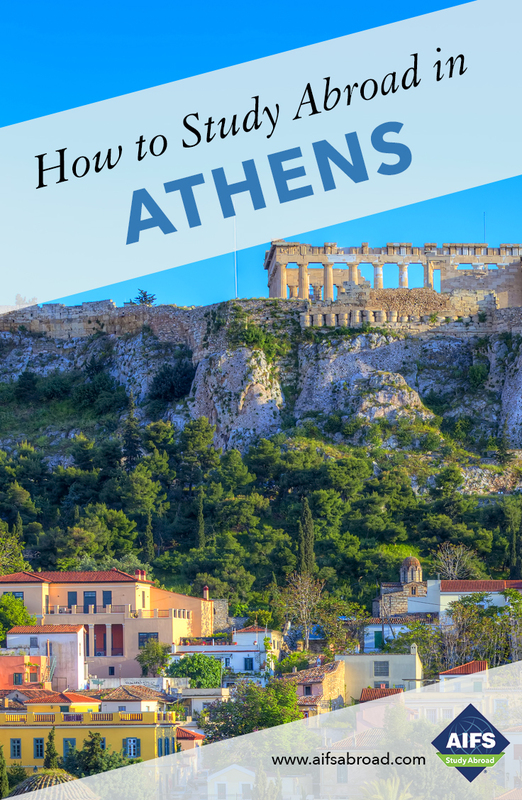 A site-based introduction to the topography and monuments of Athens from the Geometric period up to the Roman period. Introduction to drawing the human figure - posture, movement and characteristics of the human body. An introductory exploration of aspects of Greek art, broadly defined chronologically, through “hands on experience,” utilizing the collections available in museums, in galleries and on sites in Athens. Students should budget $100-200 for museum entrance fees. A study, in English translation, of some of the most important works of Greek literature, placing them within their cultural context. Introduction to the rich world of Greek and Roman mythology with an examination of their appearance in literature and culture. Overview of the mass media industry including the history and the role of mass media in shaping public opinion. Overview of the American criminal justice system. Examination of its various phases: investigation and detection of crimes by the police; prosecution of alleged offenders; adjudication of cases by courts; re-integration. Study of the role, organization, ethics and limitations of law enforcement, courts and corrections. Emphasis on the IV and V Amendments to the U.S. Constitution. Looking at current trends of theater in Athens, students will attend a wide spectrum of theater performances and analyze their attributes in the classroom. Focuses on major trends in the Greek economy since WWII including fiscal and monetary policies and a discussion of problems like inflation, tax evasion, the public debt, balance of payments, education and security. This course also includes Greece’s accession to the EEC, membership of the Eurozone and the onset of crisis in 2009-10. This course develops a student’s listening, speaking, reading and writing skills in Modern Greek. Historical, political and cultural developments in Greece from the Revolution to the age of Venizelos. Covers the birth and building of the modern Greek state. Developments in Greece from the Balkan Wars and the National Schism to the present. Particular attention is paid to the role of Greece in the two world wars, the causes and consequences of the Civil War and the Dictatorship of 1967- 1974 and the nature of the restored democracy after the fall of the junta. Explores the interrelationship of private stories and public experience through study of the characteristics and function of oral story-telling. Focus is placed on the connection between story-telling, personal memory, and social/historical experience. Students are exposed to the techniques and processes of oral history, such as conducting interviews; handling materials ethically and responsibly; and composing and editing research documents and projects. Major emphasis is placed on experiential learning as much of the course will involve direct contact with the object of study. Students will work under the guidance of the instructor on specified subjects that will vary from semester to semester. This course includes 15 hours of service learning within the community in Athens. Previous students have worked with the refugee population as part of this service component. A minimum 3.5 GPA is required for this International Honors Course. Essentials of international business including the international business environment, international business law, cross-cultural interaction, international accounting, international finance, comparative management, international marketing, and global corporations. Topics include: origins and growth of tourism, tourism as a global phenomenon, demand and supply of tourism, the Greek tourism industry and its role in the Greek economy, the structure of the tourism industry and future prospects for Greek and international tourism. Principles for tourism development and planning based on a comprehensive, coordinated and managed approach. Stakeholders involved in the development of tourism policy and planning and complexities of economic, social and political factors involved. Integrated analysis of the strategic planning process at the international and supranational levels, illustrated with (international) case studies. Impacts of tourism policies on tourism businesses and entrepreneurial activity. Basic understanding of marketing concepts and processes including key marketing decision areas in product development, pricing, distribution and promotion. Survey of the basic elements of music: style, form, performance media and interpretation. Focus on Medieval, Renaissance and Baroque music. Principles of chemical and biological oceanography with emphasis on chemical and biological processes, the properties and origin of water and salts, major constituents, dissolved gases and nutrients, the carbon dioxide system, coastal processes, the biological productivity of the oceans, ecology, distribution and classification of marine organisms, ocean resources and ocean pollution. Discussion of the most influential philosophical answers to ‘big’ questions about reality, ourselves and our place in it. Examination of the relation of philosophy to other disciplines and its role in daily life. An introduction to basic problems and theories of modern philosophy. The use of reasoning in moral assessment of actions and persons. Theoretical perspectives and research methods, life-span development, mental abilities, personality theory and assessment, stress and coping, psychological disorders and treatment, social behavior. Theoretical approaches and methodological issues, biocultural foundations of development, prenatal development and birth, physical, cognitive and socioemotional development in infancy and early childhood. Emphasis on ecological and contextual perspective on development and on the practical implications of developmental science behavior. Health in relation to age, gender, race, socioeconomic status, social stress, health and illness behavior as well as healing options in American society. The sick role, doctor–patient interaction, the role of physicians, nurses, midwives. The development of hospitals, their organization and the rising cost of health care delivery. Health care delivery in the USA, the first world and formerly socialist countries as well as in other countries. Contemporary communication theory, rhetoric and principles of speech writing. Development, organization, and delivery of informative and persuasive presentations. Training in verbal and non-verbal skills. Introduction to reading, writing, and thinking skills central to academic discourse. Emphasis is placed on summarizing and critically responding to non-fiction texts. AIFS students who have a GPA of 3.5 or above are eligible to apply for the International Honors Program at the American College of Greece where they will be able to choose from a select number of 3-credit Honors seminars.